For many years, the way to operate a law practice remained unchanged. Now however, the times are a-changing; IT has completely transformed the legal field. Whether you’re in need of a corporate intranet, project workspace, client extranet, virtual data room, or an effective file sharing solution, IT consulting in Houston can advise and explain how to modernize your law practice. Lawyers need to work faster, smarter and with minimal effort, in the office or on the road, regardless of area of practice. Both large and small law firms are embracing cloud-based technology in an attempt to enjoy a competitive advantage. Legal documents such as letters, forms, legal briefs, and contracts are what drive the legal world. Therefore, you must handle them with utmost caution and sensitivity. IT consulting in Houston can advise you how to store, share, manage, and access your documents quickly and securely anytime and from any location. The use of email as a distribution method is popular but unsecure. Through cloud-based collaboration that features SSL encryption, your data will always be secure. To guarantee you peace of mind, experts always mirror your data instantly with backups being transferred to the secondary data center every 24 hours. Project management is handy at simplifying today’s complex legal cases. Collaboration provides a transparent environment to ensure everyone is accountable. That leaves you with ample time to concentrate on the most important things. Now more than ever, clients are demanding better cost efficiencies. Cloud-based collaboration is effective at helping you to bring down the time you waste looking for documents or tracking folks that have responded to important notifications or emails. You enjoy having everything (billing records, calendars, tasks, discussions, etc.) that is important in one uncluttered place. Law firms are adopting flexible working. The current crop of law firms is recruiting more lawyers in order to work flexibly. Flexible firms are highly likely to rake in talent due to the enhanced work-life balance it brings with it. Additionally, thousands of lawyers are currently connecting with their clients exclusively or primarily in the virtual world. By doing that, they’re able to take full advantage of the cost and time-saving benefits related to remote working. Setting up a remarkable online collaborative workspace shouldn’t be challenging. Actually, all you require is an Internet connection and a web browser. Setting up your workspace shouldn’t take long. You can even brand it by utilizing your own imagery, colors, and business logo. Anytime your clients and team members log in, there will always be a welcome screen that promotes your business. One of the top priorities of big law firms is to shift from conventional methods of communication to online collaboration. This is because of the numerous advantages it brings with it. 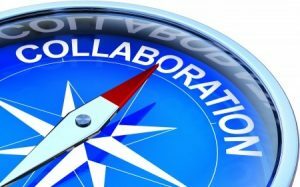 The above are some of the benefits that collaboration for lawyers boasts of. To learn more about how you can utilize this in your law firm, contact us at HoustonTech today. We offer IT consulting for Houston law firms, as well as other managed services and solutions.